University of Guam Marine Lab scientist, Tom Shils and coauthor Heroen Verbruggen of the University of Melbourne have recently published an article describing a new species of algae found in the waters of Guam. 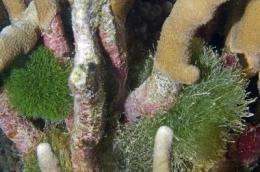 Rhipilia coppejansii is the fifth green alga described from the Mariana Islands and the first one since 1978. "The molecular tools that aided its identification also reveal that previously undetected biodiversity abounds in the marine algal flora of Guam, which is an integral part of the island's natural heritage in which its people and their culture are deeply rooted," says Shils. This newly described species was found in the waters off the west coast of Guam collected from the Piti Bomb Holes area. In general appearance it is similar to Turtle Weed (Chlorodesmis) as both algae form green tufts at the base of coral colonies, but under the microscope Rhipilia's fascinating structure revealed itself. "Our paper exemplifies the large amount of hidden (cryptic) diversity that we've recently been discovering in our marine flora. Molecular tools reveal that the species diversity of algae has been greatly underestimated for our islands," says Shils. University of Guam researchers provide an invaluable service for understanding the marine and terrestrial ecosystems of the island and the region. More information: Verbruggen H. & Schils T. 2012. Rhipilia coppejansii, a new coral reef-associated species from Guam (Bryopsidales, Chlorophyta). Journal of Phycology 48: 1090-1098.